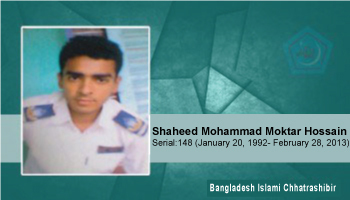 On February 28, 2013, he attained martyrdom in a picketing spot at Chandidasgati picketing spot at Sirajganj during the strike program called against the verdict of Allama Delwar Hossain Sayedee after being shot by RAB. He was from Sirajganj Police Lines School and College,and a HSC meritorious student. Last study: Sirajganj Police Lines School and College Class 11. Sirajganj Police Lines School and College Class 11.